to help you effectively work with your clients struggling with a personality disorder. Earn up to 15 CE Hours — Included in the price! 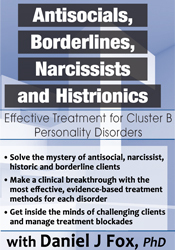 Designed to provide you with the knowledge, skills, and abilities to accurately identify and treat your most difficult personality disordered clients. Through case studies, video examples, and discussion, Modules 1 and 2 will help you get inside the minds of your Cluster B clients and make therapeutic breakthroughs with evidence-based treatment methods for each disorder. The need for newer, better, and more efficacious treatment methods for personality disorders lead to significant changes in the DSM-5®. From the developmental roots of these disorders to the most difficult therapeutic concerns and the most promising treatment options, explore the latest diagnoses, challenges, and therapies for these complicated disorders. It will also help you create strategies to build your resiliency and decrease compassion fatigue.. The identification, management, and treatment of attachment and psychopathology are critical to client growth and therapeutic success. 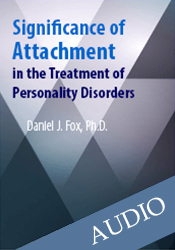 In this special webinar recording, Dr. Fox will discuss the basis of attachment and its relationship to personality and its relevance in your everyday practice. Dr. Fox's philosophy is to give you techniques you can use right now on your next client, whether it is this afternoon, tonight or tomorrow. Narcissism is a destructive but often misunderstood personality trait. In this 90-minute video, you will begin to understand narcissism through correlated behaviors, its relationship to self-esteem, its genetic roots, and its environmental and cultural causes such as parenting styles, media influences, and new technology. 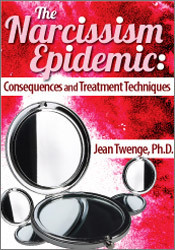 You will also get practical strategies for helping narcissists and those around them. These include helping narcissists recognize how their behavior undermines their success and relationships, and slowly moving toward seeing how their behavior affects others. Sign Up Now and Get This Bonus PDF eBook! 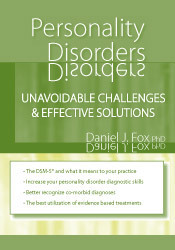 Written for clinical professionals to increase therapeutic efficacy through the examination of each personality disorder in the Diagnostic and Statistical Manual (DSM), this guide covers general personality disorders and manifestation, neurological components, a developmental psychology approach to understanding how personality disorders develop and why they do not in some people. Each chapter on the individual personality disorder includes up-to-date information on etiology, prevalence, diagnosis from various sources above and beyond the DSM, case examples, and more. Bonus Audio! Dear Colleague, I know what it's like to work with difficult personality disordered clients day in and day out. These clients are intense, but we became therapists to improve the lives of even our toughest clients. I want you to take a moment to imagine yourself in session with your most difficult client. Now imagine having a fresh approach, a clearer understanding of their mind, and a new set of research-based tools to help them. I'm ready to share with you my intensive tools crafted over years of working with PD clients. This course is designed to provide you with the knowledge, skill, and abilities to accurately identify, and treat your toughest clients. Plus, it’s a great way to earn 15+ hours of CE credits from the comfort of your own computer! This new, online, intensive Personality Disorders course will give you the tools you need to see even your most challenging clients thrive—all of these tools have been refined and proven effective in my 14 years of treating and assessing PD clients. Aside from three weeks of information-packed materials, and the hour-long question and answer session live with me, I'll also be participating in the chat forums, answering questions, giving feedback, and more. Add the full video downloads, audio download and PDF eBook to your reference library to reference again and again in the future. Download everything in this series. It's yours to keep forever. 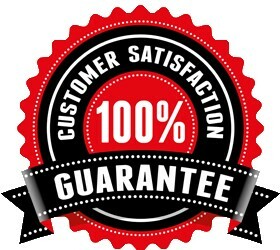 100% satisfaction guarantee - If you're not completely satisfied, please give our Customer Support a call at 1-800-844-8260. We’re thatm confident that you'll find this learning experience to be all that's promised and more than you expected. Login to begin viewing the two full-day seminars and all bonus materials right away. Complete CE tests online when convenient for you, to earn up to 15 CE Hours.